Barry Dickinson, Provincial Junior Grand Warden, was delighted to attend Hindley Masonic Hall as the principal guest and representative of the Provincial Grand Master Tony Harrison, at the installation ceremony of Prodesse Lodge No 8678. Barry was accompanied by grand officers, group chairman Geoffrey Porter and Stephen Gregory, supported by acting Provincial grand officers Eric Bailey (PrSGD) and Geoffrey Whittle (PrGStwd), with further support added by Ian Green, group charity steward. All were there to witness the installation of Paul Joynson. In addition, a contingent of East Lancs Masons, who know Paul from other Masonic Orders, made the journey west to support their friend. 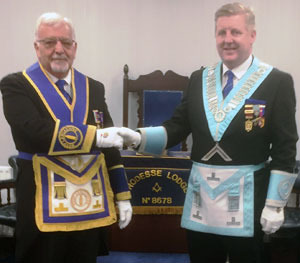 Barry Dickinson (left) congratulates Paul Joynson on attaining the chair of Prodesse Lodge. Mike Rollins (WM) was pleased to receive the representative of the Provincial Grand Master on his visit to Hindley from the neighbouring Masonic Hall at Bryn. It was a delight for Barry to be invited to a lodge in his own Wigan Group, and to be greeted by so many familiar and friendly faces. He was to witness a wonderful ceremony. Mike Rollins invited his father Brian to take the chair and, led by DC Ken Wilson, delivered a great performance assisted by members of the lodge. Paul confidently took the chair. Jack Lyon, who has the honour of being the first initiate into Prodesse Lodge, gave the address to the new WM, Ken Wilson the address to the wardens, while Barry Dickinson performed his duty well in delivering the address to the brethren of the lodge. The working tools were presented, in excellent fashion, by Jim Miller, and junior members of the lodge, Alex Goulden and Ryan Magnall, who did a splendid job. On congratulating the WM, installing master and all the officers who took part, Barry was delighted to bring the greetings of the Provincial Grand Master, who would have been really impressed by the work carried out. He was also pleased to receive charitable donations to the sum of £950, in favour of a local ruby organisation (£300), Masonic Charitable Foundation (£350) and Hindley Masonic Hall (£300), which is a commendable effort from such a small lodge. A fine festive board followed in the normal friendly and lively atmosphere. Dave Goulden sang the master’s song, accompanied by Karl Greenall. The lodge charity efforts started heading in the right direction when the raffle for a bottle of whisky raised £265. Paul is an experienced Mason, originally in the Leigh Group, having served as WM twice before. He is a policeman, and specialist in road traffic accident investigation. Paul is looking forward to his year and specially to organising a number of new social events and lodge visits. Sound like a fair cop for Prodesse. Pictured from left to right, are: Ian Green, Stephen Gregory, Geoffrey Porter, Barry Dickinson, Paul Joynson, Mike Rollins, Brian Rollins Eric Bailey and Geoff Whittle.